The United Nations Slavery Memorial, located on the United Nations Visitors Plaza in New York, was designed by Haitian-American architect Rodney Leon. It includes three main elements: a large triangular sculpture with a map depicting the triangular slave trade; a prone human figure depicting those who were transported overseas enslaved; and a reflecting pool mean to honour the memory of those who died in slavery. 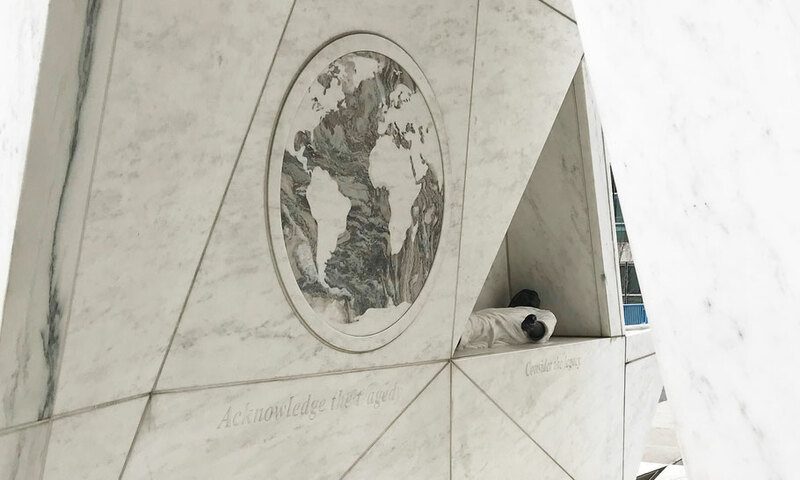 The permanent memorial was unveiled on 25 March 2015, which marks the International Day of Remembrance of the Victims of Slavery and the Transatlantic Slave Trade. The Ark of Return will invite people everywhere to contemplate the legacy of the slave trade and to fight against racism and prejudice today. Rodney Leon was also the designer of the African Burial Ground Memorial in New York City which is the only National Monument in the United States dedicated to the contributions of people of African descent.